At a time when government propaganda and corporate spin are increasingly presented as fact, and a handful of corporations control the news, A TRIBE OF HIS OWN: THE JOURNALISM OF P. SAINATH reminds us what news media can be. In India, nearly 400 million people live in poverty. Believing that responsible journalism can help to change things for the better, Palagummi Sainath wrote a series of 70 newspaper articles for The Times of India chronicling the living conditions in the ten poorest districts of the country. For two years Sainath lived in the communities he wrote about; he traveled across India, often on foot, in hill areas, drought-prone areas, and tribal areas to put the issue of poverty back on the national agenda. 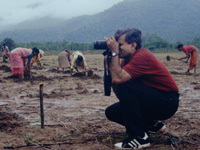 After nearly a decade of work and dozens of awards, Sainath remains as passionately committed as ever. According to Sainath the shift from hard-hitting, truth-seeking journalism to innocuous, promotional stenography goes hand in hand with the increase of globalization. This, he believes, has also contributed to the 1990s becoming "the time of the most gross social inequality since the Second World War." A TRIBE OF HIS OWN follows Sainath to the Indian villages he writes about and explores his contention that "journalism is for people, not shareholders." "Mesmerizing...In less than 60 minutes, this little film about an Indian reporter delivers powerful insights into the enduring story of human suffering and its shining corollary, imperishable hope. Equally interesting is the way it turns a cold analytical eye on mainstream journalists like me and challenges us to do more with the privilege of free expression bestowed upon us by democracy." "In the age of media convergence and indistinguishable pack coverage of staged events, news conferences and celebrity capers, Sainath's passionate pursuit of individual truth to illuminate society is a clarion call for more thoughtful journalism. All journalists, veterans or newcomers, would benefit enormously from learning his methods." "Through his writing, photography, and teaching of young journalists, he has become a powerful and passionate voice for the people...The film itself is a solid piece of journalism...Recommended for academic and public libraries." "An intriguing educational tool, useful for both journalism students and veterans of the business...outstanding film documentary."